Museum 2.0: Brooklyn Clicks with the Crowd: What Makes a Smart Mob? Brooklyn Clicks with the Crowd: What Makes a Smart Mob? I've written before about the inspiring work that the Brooklyn Museum of Art is doing with their community-focused efforts. They're now running a compelling experiment in crowd-sourced exhibition creation and curation via the photography exhibition Click. This post provides an overview of the project, what makes it stand out, and some analysis of the strategic implications. The Museum solicited photographs from artists via an open call on their website, Facebook group, Flickr groups, and outreach to Brooklyn-based arts organizations. On the web, a jury of the masses (anyone) can evaluate the photographs in terms of aesthetic quality and relevance to the exhibition theme. All evaluations are private; all artists are unnamed. It's very easy to sign up and judge... and you can do so now by registering here. The photographs will be installed in a physical exhibition running for six weeks this summer. The art will be displayed in order of the average juried scores. Visitors will be able to see how different subgroups (including art experts) ranked and responded to the art. The exhibition will coincide with programs about art theory, online communities, and crowd theory, providing a forum for public evaluation and discussion about the process. In this way, Click is a powerful example of the "venue as content platform" definition of 2.0. The internal team is led by a non-curator. The in-house team for Click included two curators, one interpreter, one artist/designer, and two web developers, but the person managing the whole project (Shelley Bernstein) is from Information Systems, not curatorial. If this were a web-only project, I wouldn't be surprised: many museum directors and curators ignore what happens on their websites (and technology people use those loose reins to create all kinds of content experiences). But it's pretty unusual to have a REAL exhibition led by a web person. This highlights the fact that while participatory design is by no means exclusive to the Web, that is the place most of the current experimentation is happening. You don't need to be a technologist to conceive or lead a project like this, but in many museums, non-techies just aren't as exposed to the ideas and products that typify participatory experiences. They kept the interface simple. Register to be a Click judge, and you'll be amazed by how little is asked of you. They don't want your home address to send you brochures. They don't require you to agree to an arduous set of terms and conditions. They ask only what they truly need to make the exhibit and the judging successful. This may sound obvious, but we all fall victim to featuritis when we get seduced by the idea of live bodies. There's a reason they call it "capturing" data. With Click, I don't feel like a prisoner. They make it easy to evangelize. While Click intentionally doesn't allow you to send your favorite photos to friends (scroll down to the "What Makes Click Really Special" section for more on this), there is a lovely page full of ways to join their virtual street team, telling others about the project through Facebook, Flickr, and more. They are sensitive to the artists who are being judged. At some institutions, there has been friction when artists find out that their work will be judged or commented on publicly by visitors. Much of that friction arises from the fact that the judging/commenting features are added after the artist has already conceptualized and installed their work. In Click, Brooklyn made the scope and depth of participation clear from the start. There's a specific FAQ for artists that explains not only how to upload art, but what's going to happen to it. Artists could choose to remain anonymous throughout the whole process or to have their names revealed in the final exhibition. While artists couldn't choose whether their score or comments would be shown, they could choose whether and how to participate given that knowledge. They ask judges to self-define their art knowledge. I found this part of the experience really interesting. When you first log in, you are asked two things: where you live and how much you know about art. You rate yourself from knowing "nothing" about art to being an "expert" on a 1 to 5 scale. When the exhibition opens in June, visitors will see the photos ordered by aggregate score, but you will also be able to look at the scores by art knowledge (and geography) on the web and on interactive kiosks. How will the art novices' choices compare to the art experts'? What conclusions will we draw from that difference? There could be really interesting research implications of this in terms of what we think we know about how different kinds of visitors respond to art. Relatedly, the geography question could glean some relevant data about how local and non-local visitors view and judge the efforts of a community-based museum. These research questions are where I start to get really excited about Click. There are implications of Click that represent more than just photo arrangement. But what makes Click REALLY Special? ... the Strategic Implications! Click is not just an application of Web 2.0 concepts and technologies to a museum project (which Brooklyn has done successfully before). It establishes Brooklyn as a leader in the development and discovery of participatory experiences more broadly--an institution that community and content managers at all kinds of (museum AND non-museum) organizations can learn from. Specifically, the Brooklyn Museum is doing research about the role of independence and influence in participatory experiences. The genesis of Click derived from James Surowiecki's book The Wisdom of Crowds. In the book, James asserts that "diversity and independence" are two of the most important factors that make crowds intelligent. If you can see how others have responded to something, that impacts your behavior, thereby making you less independent and minimizing your diversity (and, according to Surowiecki, less able to contribute to collective wisdom). This makes sense. When you are in a mob, heavily influenced by others, you are not smarter. This is true whether you are tromping around the Dallas airport with thousands of other panicked stranded travelers, as I was last week, or watching the dramatic prairie dog video your friend sent you from YouTube. The fact that 4.3 million people have watched the prairie dog video does not make it a great video or an intelligent use of time. As we started planning for this phase of the exhibition, I started to recognize that many of the features we see on successful websites today are designed to foster community, but they also create a great deal of influence. The view counts, comments, favorites, most e-mailed, and leader boards of sites we all love (Flickr, Digg, StumbleUpon, NetFlix, The New York Times, etc.) are built on the influence of others, so when thinking about the online components of this exhibition, we wanted to minimize influence as much as possible and re-think features that are now commonplace. Of course, there have been plenty of times I’ve wondered if anyone would take part if we didn’t include some of these features that everyone has come to expect, but we’ll have to wait and see on that one. How did they promote independence in judging? As a Click judge, you can't view other peoples' comments or ratings, even after you've scored a particular image. You can't set photos as favorites for others to see. You don't see the highest ranked photos first. You see the photos in random order, and the direct URLs are suppressed so you can't mail or save any one photo to share with friends (and encourage them to vote for it). In other words, you can't have a networked, social experience--the experience we've come to expect from Web 2.0 sites. But in Click's case, that prohibition is deliberate. Museum 2.0 concepts and Web 2.0 technologies are still a major part of the Click experience, but they are more narrowly focused on conferring authority to the public rather than providing a social experience. This allows Brooklyn to study the relationship of curation interface to exhibition output specifically, and to therefore perform some research in the basic question of how participatory experiences work. Unlike most commercial Web 2.0 sites, the Brooklyn Museum's bottom line is not about making money. It's about making intelligent decisions about how to engage visitor/participants with their institution. To that end, they are blogging their process openly and have scheduled a slate of self-reflective programming to coincide with the Click exhibition. There are many compelling research questions that can extend from Click. How would you design a crowd-sourced exhibition whose goal is to garner the highest participation (as opposed to the wisest participation)? How would the selections of a group with "social influence" tools available to them differ from the forced independence of Click judges? How do these experiments impact the quality of museum exhibitions for visitors who were not involved in the participatory process? Do those visitors notice, or care about, the difference? This research, especially when it comes to participatory experiences in public spaces (like museums), is not already happening somewhere else. The Web moves quickly and self-reflection has little value in a young field with a "what's hot this second?" mentality. Museums are uniquely positioned to be these reflective "live research" spaces. We have great content. We have established, trusted platforms. We have qualified researchers. We have a bottom line that's about visitors rather than advertising dollars (hopefully). In short, museums have the assets to assume a new value proposition as leading participatory institutions, places you go to have the most content-rich, compelling, networked user experiences. But we'll only get there if we join Brooklyn in the lab and start our own experiments to test the hypotheses, measure the results, and find out what clicks. Dear Nina, this is truly inspiring. Thank you very much. We are so distant from such projects, in Italy. And thank you for letting me know about the Egypt exhibition's blog - that was helpful, indeed. I am writing a feasibility study for a science centre in my town (north of Italy) and your blog is so helpful in keeping me up-to-date. Next week I will go to a conference in Barcelona (Towards a total museology) and I am looking forward to learn more - and I would be glad to give you some feedback, if you're interested into. It establishes Brooklyn as a leader in the development and discovery of participatory experiences more broadly--an institution that community and content managers at all kinds of (museum AND non-museum) organizations can learn from. You are absolutely right. And let's put this into even greater context -- this is an art museum. Institutions not generally known or understood as participatory. I was at the Brooklyn Museum over this past weekend to see the Murakami exhibit. It's the most fun I've had at an art museum in probably 5 years (since my summer internship at the MCA Chicago, actually). The exhibit was popular (we waited on line for an hour to get in). But the museum and the plaza in front exactly the kind of wonderful gathering spot that great museums can be. The plaza was joyful actually. With skateboarders, bicyclists and families all sharing the space in harmony. (In DC as I pointed out elsewhere, the skateboarders would have been arrested and the bicyclists would have been relegated to another location.) The fountain, the bridge, the cherry blossoms, the steps. It still makes me smile. 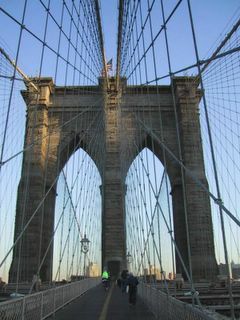 I have been following the Brooklyn Museums online efforts (get their tweets, participated in Click! as a crowd curator), but it was great to see that kind of engagement and community building going on in the physical realm. There's a great story about when Brooklyn redesigned their plaza/building--they intentionally kept and improved the lighting, open space, etc. that was conducive to use by skateboarders rather than turning those folks away. Another example of how these kinds of initiatives fit into larger core mission and support from top management. Brooklyn is a community-focused museum in all ways, which makes experiments like this in-line with their mission rather than an underground aberration. Hi Nina, thanks for posting! Christopher, this testimonial will probably make it into a presentation of mine :) glad you had a good visit! Great post! I agree with your analysis and also find Shelley's work at Brooklyn insipring. We've followed their model in my museum, but we also need to find a different way to make it work for us as we are not an art museum. We are a social history museum and war is our focus, so what we do in this field must be done carefully. In my own blog I've been trying to get across the critical importance of museums exploiting the advantages we have - rich content from our collections and also a trusted position of authenticity from the public perspective. Therefore, I really enjoyed reading the last sentence in your post! The students in my graduate museum studies course “Introduction to Digital Museums” at Johns Hopkins have been discussing your post and the implications of the Brooklyn Museum’s Click project. Everyone is impressed by the originality of the idea to host an exhibition based solely on public submissions and "a jury of the masses" and we can see that it is in line with their focus on "the primacy of the visitor experience.” We applaud them for their outreach efforts, but at the same time we wonder how this project integrates with their mission to "act as a bridge between the rich artistic heritage of world cultures, as embodied in its collections..." It seems that they are building something new and separate from what they already have. Other than providing the place for a physical exhibition, we are not sure that Click is something that particularly needs to be connected to a museum. Given that Click is not being curated by a curator, this type of event could as easily be held on college campuses, in community centers, or any other real or virtual venue. Doesn’t it amount to more of a popularity contest than any sort of real evaluation of the merits of the submitted photos? On the other hand, when people admire paintings, photographs, and artwork of all kinds in museums, they are told those are the ones worth admiring because they are inside that museum's walls. Click will allow us to see what the public considers beautiful art. It will be interesting to see what kind of response the Brooklyn Museum gets in terms of submissions, evaluators, and attendance at the resulting exhibition. Thanks so much for your comments, in fact many of them where things we discussed in the planning phases of the exhibition. Regarding the mission and acting as a cultural bridge, we hope the exhibitions theme (“the changing face of Brooklyn”) accomplishes that to a degree. There are many cultures throughout Brooklyn that have been captured by the crowd of photographers – I hope that is evident as you evaluate the works. While that does not cover the collections, we often do both collection exhibitions and non-collection exhibitions – sometimes we even do both! Re: popularity contest. If you read my blog post on Minimizing Influence, you’ll see we are closely following the theories of the book in our implementation – even the author says crowds need to be independent to be wise – and everything we’ve designed has reflected that. The very fact that images are presented at random, skipping is prevented within the interface and sending a link to individual photos lessens the amount of “go vote for me” popularity. Regarding the “evaluation of the merits of the submitted photos”, I hope that is also clear as you evaluate – what we are specifically asking each evaluator to think about when assessing the merits of a work. Dear Nina, I read your blog since the last November, when I start a research project in my University (in the North of Italy) focused on applying mobile and web 2.0 technologies in cultural heritage sector. Even if we are at a starting point stage, our work has been accepted in a workshop at the WWW2008 conference. The concept of smart mobs as primary content creator in museum exhibition (for ex.) is one of the main focus of our research. As what you write in your last sentence, we exactly aim "to test the hypotheses, measure the results and find out" an answer to the question if we can consider smart a mob involved in cultural content creation. Shelley, thanks very much for your feedback on the comments from our class. It was very useful to us to know that the issues that came our minds were among those you considered. I've since signed up to be an evaluator and am most impressed with the interface and the care that has been taken to level the playing field for all participatants. Hi Ruth, thanks for evaluating! We've gotten a lot of feedback (lots of resistance, actually, so it's nice to hear some good feedback) about the evaluation tool. Keep an eye on the Brooklyn Museum blog, we should have some interesting posts up about this part in particular once the evaluation stage has completed. I am participating in Click! and think the most exciting aspect of this exhibit is the anonymity of the rating process. The crowd is truly judging the works on their own merit, and I, for one, can't wait to see the results of the crowd's decisions. I am designing a project similar in Brazil, i am planning prelimilary analysis phase, and technical plan requirements. The idea of creating collaborative art, with web maps with the people Photographing the São Paulo Subway. How Much Time Does Web 2.0 Take?